A weekend pass is an excellent deal at $99, but railroaders and historical society members may purchase the pass for $89. This must be done over the phone at (315) 724-0700. Call today and tell them you are a NYCSHS member. 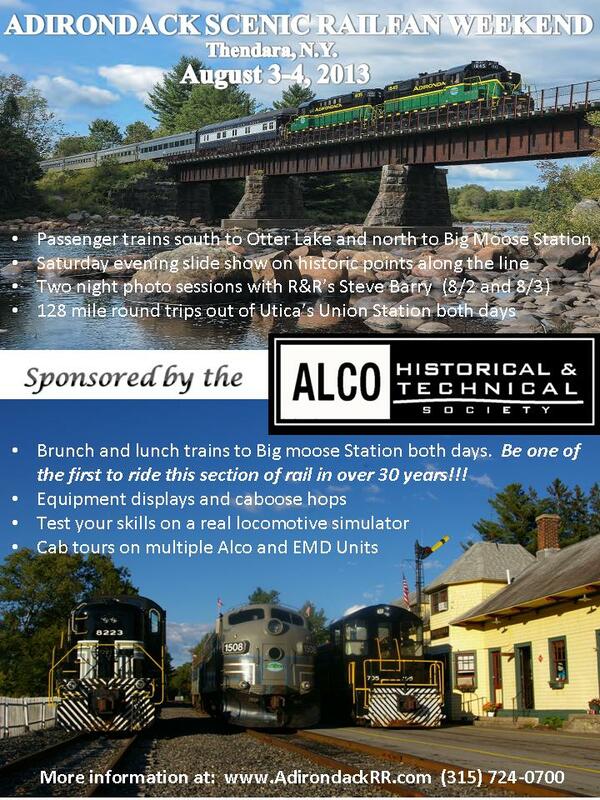 Railfan Weekend August 2nd, 3rd & 4th at the Adirondack Scenic Railroad, this event is being sponsored by the ALCO Historical Society….. Come enjoy the cool mountain air in the Adirondacks with multiple ALCO’s and EMD’s. Click here for event poster. This event will start at 8:30 Friday night with a night photo shoot at the historic Thendara station. The photo shoot will be run by Railfan & Railroads Steve Barry. It will include historic NYC power, cost is $20 per person. On Saturday trains depart both Utica and Thendara at 9:30 am. The Utica trains will be covering a 128 mile round trip to Big Moose and return with a layover in Thendara. The 9:30 Thendara “Brunch train” will be heading for Big Moose Station and return to Thendara at 12 noon. The Utica train will be departing Thendara with the Big Moose Lunch train at 12 noon as well. The Thendara station area will have lots to see, historic equipment, Caboose hops with our Boston & Maine cabin car, cost is $5 per rider, kids under 2 free. You have the opportunity to place your hands on the throttle of a real locomotive simulator, that was a big crowd pleaser at our 20th anniversary last year. I can say first hand this is like running a real train. (I was one of the very few lucky ones to make it over “Marais Pass” on the BNSF, cresting the grade in a snow storm at 4 mph) Cost of the simulator is $5 per try. The ALCO Historical Society will be on hand with information and memorabilia as well as hands on with locomotive cab tours that will be available most of the day. Click here for simulator photo. At approx 7:30 pm the second Special Night Photo shoot train will depart for Big Moose. A great meal will await this limited number of people at Big Moose Station. Dine inside this historic station (extra fee) the history of the New York Central is everywhere, in the original station bench seats, looking through the original ticket window and more. After a belly full, will step outside as Steve Barry once again performs his magic night night photo shoots. Original NYC RS-3 8223 will be the star of the show with some other power as well (possibly an F-unit). This will be the first opportunity to photography trains at night in Big Moose in over 30 years. The railroad just extended the line to Big Moose a few weeks ago. This was the highest passenger point served by the NYC (so I’m told) coming in at 2048ft Above. Cost $30 per person, includes train ride, does not include dinner. Click here. Sunday will be a repeat of Saturday with no photo shoot or slide show. We will have the brunch and lunch trains as well as the simulator, caboose hops, cab tours and a photo run-by or two. Tickets will be available on the railroads web site on Monday July 1st.. There is a special railfan event ticket going on sale July 1st, and I don’t know how you can beat this guys!! $99 and you get it all, unlimited pass for all trains at all locations, including caboose hops. It gets you on your choice of a brunch train “or” lunch train to Big Moose *including meal*. 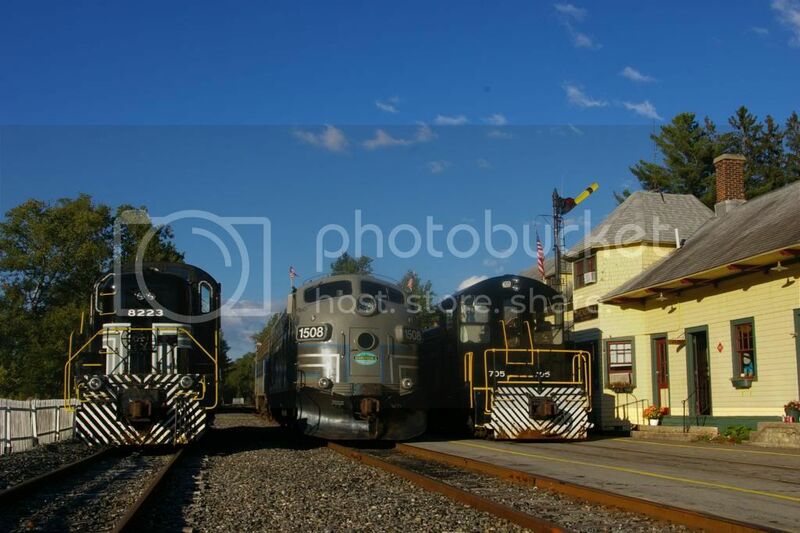 A turn at the simulator on Sat or Sun, also gets you in both night photo shoots with Steve Barry as well as the New York Central Adirondack Division slide show. Plus enters you in a raffle for a 10 mile cab ride from Otter Lake to Thendara. I stress this is a family event and the town has so much to offer !!! Guys bring the wife and kids to this one. The following is a list of hotels with in 1/2 mile of the station. These will book up early. Van Aukens Inn across the street from station. Moose River House B&B across street from station. Adirondack Lodge 1/2 mile North. Largest water park in NY state, drop the kids off for the week. Boat tours of the Fulton chain. Scenic views from McCalluy Mountain. thanks for reading, where hoping to see you all there, please mention this event to your friends in the rail community. More info and tickets on line this week.